In our years of experience, we here at Cadena Family Dentistry have found that dental crowns are great options for several different situations. Simply put, a dental crown is a “cap” that is placed over a tooth. This cap can be used to cover a tooth that has had a large filling placed – especially when there isn’t much natural tooth left for the filling to bond with. Crowns are also a wonderful way to hold a tooth together when it has been cracked or has been weakened. Crowns can also help hold a dental bridge in the correct placement or restore a work or broken tooth. Not every crown is porcelain, though there are some situations in which a dental crown is really the most appropriate option. In the case of teeth that have been so severely discolored that a typical whitening procedure is insufficient to correct it, crowns are a wonderful option! 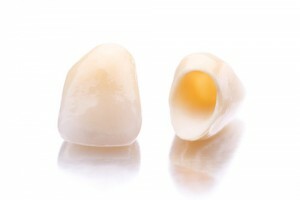 Porcelain crowns are also best suited for covering a dental implant and for making any cosmetic corrections. Porcelain crowns are also really the only appropriate option for the patient who has a history of allergy to any metal. There are some cases where a patient may choose a gold or metal alloy crown due to cost or just an aesthetic choice – or where an insurance company may refuse to pay for porcelain and require that the patient receive a metal crown if they want the procedure covered. These cases are becoming more and more rare and so Cadena Family Dentistry works almost exclusively in porcelain for our crowns. The procedure for receiving porcelain crowns is relatively simple and straightforward. First, we will prepare the tooth. This can mean anything from a simple cleaning and drying, to a removal of decaying area. 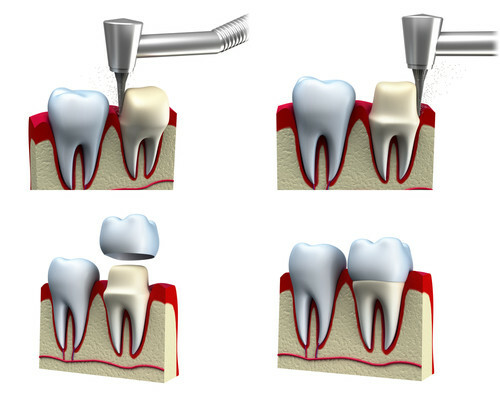 Once the tooth is prepared, a mold is taken of the area where the crown is to be applied. This mold is sent to the dental lab along with any specific instructions regarding the desired shape, color etc. While your permanent porcelain dental crown is being created for you, we will custom create a temporary acrylic restoration to protect your tooth until your permanent crown is ready. After your temporary crown is in place, we will meet with you to give you all of the information you need to know about caring for and maintaining it as well as how long you should expect to wait for your permanent crown to arrive. Your next visit will be to apply the permanent crown and is just as simple as your first one. The permanent crown is applied by cleaning and drying the tooth or teeth to be crowned. The permanent crown is then slipped over and permanently bonded to your tooth or teeth. That’s it! Once your crown is in place, it’s important to avoid chewing hard foods or ice for a while. These hard foods could dislodge your crown and shorten the life-span of the porcelain. If you habitually bite your nails, it’s important that you stop. Finally, if you grind your teeth or clench your jaw as you sleep, you may require a night guard in order to protect your new crown.